Once upon a time there was a CF mother who was looking for anything that might help her son with CF. Sound familiar? For those of you not familiar, Dr. Valerie Hudson’s foray into CF research began after her son, John, now 6, was diagnosed with cystic fibrosis as a baby. In her desperation, she taught herself anatomy from her older son’s high school anatomy textbook and began her long journey into the field of CF research. As the years passed, she became intrigued with the chemical glutathione and its role in the cell. After coming to believe that this chemical could make a difference in the health of her sons, Dr. Hudson eventually recruited Dr. Bishop to run a small, preliminary study using inhaled glutathione. Dr. Hudson presented their results. Glutathione (GSH) is a tri-peptide, a very small protein, present throughout our bodies, but it appears in especially high concentrations in the epithelial lining fluid of the lungs. (Epithelial cells are the cells that line the inside of our lungs and they produce this fluid.) When the body has to deal with high levels of free radicals and oxidative stress, as is the case in CF lungs, the body provides higher levels of GSH to help it cope. GSH has several properties. It is a natural mucolytic. It helps regulate the immune response, as both an anti-inflammatory and as a cell-signaling molecule directing the white blood cells as to where and what to fight. It scavenges free radicals, and it is an anti-oxidant. Additionally, oxidized GSH protects proteins during stressful events in the lungs. There is significant evidence of the importance of GSH in CF pathophysiology. At the 2000 CFRI Conference, you may have heard Dr. Rabin Tirouvanziam give an update on his GSH research. Dr. Bishop reported on a more recent study that showed that normal mice lung cells, when challenged with Pseudomonas aeruginosa, increase levels of epithelial lining fluid GSH six-fold to help fight the infection. By contrast, CF mice have significantly lower levels of a GSH response. This response is severely reduced in people with CF as well. Dr. Bishop presented his small-scale, preliminary trial using inhaled glutathione. The GSH used was “pharmaceutical grade of 98.6 percent,” it was buffered and diluted to minimize irritation, and it was tested and found free of bacterial and fungal products. He also relied on the results from seven other published human trials, which observed no significant adverse events when used. In his randomized, placebo-controlled, double blind, clinical trial of inhaled GSH, Dr. Bishop recruited 19 subjects. Ten used the inhaled GSH and nine used the placebo. The age range of the subjects was from six to eighteen, and the trial occurred during the summer months. Patients inhaled through a mask nebulizer approximately 66 milligrams per kilogram of their body weight of GSH mixed with sterile water, divided into four daily inhalations sessions, each three to four hours apart. The results of this clinical trial showed significant improvement in 11 out of 13 factors measured before and after use of GSH, including peak flow, overall improvement in health, and reduced cough. Dr. Bishop is the first to recognize the limitations of his trial (size is a significant factor), while drawing the following conclusions. GSH deficiency in epithelial lining fluid may play a major role in pathogenesis of CF, and GSH inhalation therapy appears to be effective for CF. Dr. Bishop issued a clear caution to parents and adults with CF that further research still needs to be done before this can be considered a legitimate therapy for the CF community. Further research needs include a large, multi-centered clinical trial, the use of an FDA-approved product, and methods to increase convenience and control of administering the product. (Patients had to prepare their own solutions using capsules and sterile water, so doses were hand-prepared. This is time-consuming and dosages are not necessarily exact). Additionally, Dr. Bishop urged clarification of the route of delivery (oral vs.inhaled), dosage specifications, schedule of administration of the drug, patient selection, and other GSH augmentation tactics. Dr. Bishop warned that this is an experimental therapy not approved by the Cystic Fibrosis Foundation. No long-term studies have been done to ensure safety and efficacy of GSH use. He further cautioned his audience that the CFF recommends not using this GHS inhalation therapy until further studies are done. It is derived from the amino acid L-Cysteine, and acts as a precursor of glutathione. NAC is quickly metabolized into glutathione once it enters the body. It has been proven in numerous scientific studies and clinical trials, to boost intracellular production of glutathione, and is approved by the FDA for treatment of accetaminophen overdose. Because of glutathione’s mucolytic action, NAC (brand name Mucomyst) is commonly used in the treatment of lung diseases like cystic fibrosis, bronchitis and asthma. 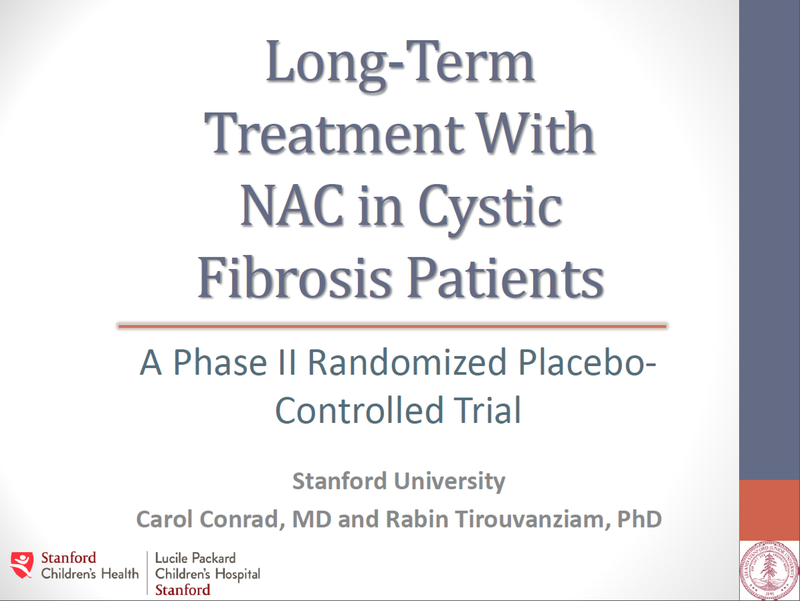 When we asked around about this a few years ago it seemed that it was destined to remain a sideline alternative treatment – with the initial pilot research driven by a CF mother and a Dr Bishop out of a Utah in 2004. However, since then other research groups have been cautiously exploring the potential benefits. We know that the Royal Children’s Hospital in Melbourne are now looking at it as part of a nutritional review and Standford University have just released a paper on it which I have posted below.